Southern Ohio Sand, headquartered in Beaver, Ohio,produces quality silica sand and gravel products for various applications. Our plant utilizes its mining, crushing, washing, sand drying and screening processes to create a high-quality product meant to exceed your expectations. We pride ourselves on the strict guidelines we have set to accommodate our customers’ diverse requirements. 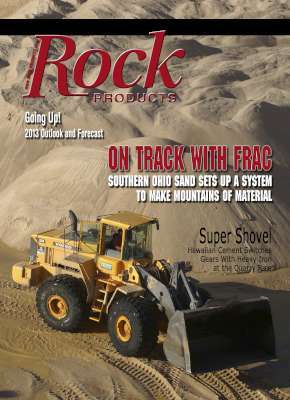 Southern Ohio Sand is the cover story in the January 22, 2013, Rock Products newsletter. Read On Track with Frac: Southern Ohio Sand Sets Up a System to Make Mountains of Material here. Mark your calendars to attend the 2013 Frac Sand Insider Conference & Exhibition, which will be held June 6-7 at the Westin Convention Center, Pittsburgh, PA. More information can be found here. Rock Products' "Frac Sand in Demand," a must-see webinar, is now available for on-demand viewing. Click here to be directed to this educational session. Participants include attorney Bryan Esch, instructor and lab director John Getty, and Southern Ohio Sand's own Jon Paglio.